I am seriously obsessed with Guacamole Recipes. I don’t need tortilla chips, veggies or anything to even dip in it…just gimme a spoon, and I’ll go to town on it. Now, even though guacamole is really nutritious, given that the main ingredient is the nutrient rich avocado, it’s still loaded with calories and fat (even though that’s the healthy, monounsaturated fat), making it higher in Weight Watchers Points than most all other fruits. So, how’s a Weight Watcher supposed to get her guacamole fix without breaking her Points bank? By trying this amazing, Low Calorie Guacamole Recipe of course! The key to rockin’ this much loved dip recipe is to find ways to bulk it up with other low calorie ingredients, and (and don’t get scared reading this part) to substitute some of the avocado quantity with peas. It may sound odd, but you really can’t tell! And of course, you will still use some avocado in it, but by adding in some low Point peas, we are able to add quantity and volume without adding a lot more calories and therefore keeping the Points value low. This guacamole dip recipe is perfectly delicious when served with some baked tortilla chips or veggies for dipping. Put it on tacos, sandwiches or try it on top of my Chicken Taco Salad Recipe! There are many, many ways to enjoy this favorite Mexican recipe. If you love your guac, and can’t bear eliminating it from your meal plan, give this delicious Weight Watchers Guacamole Recipe a try! Oh! I wanted to give a special shout out to the COWS (Considerate Outstanding Working Sisters) from North Adams Elementary in Seaman, OH, who I hear have started their own Biggest Loser Diet Plan and are regular readers of my blog! Thanks for the support, ladies and good luck!!! Put peas in a medium bowl and mash with a fork until almost smooth. Add in avocado and mash that into the peas until smooth. Add remaining ingredients and stir until combined. Cover surface with plastic wrap and refrigerate up to 1 day. Makes 6 servings. Serving size is 1/3 cup. this sounds great, but do you know the value of new pts+. thanks. I made it for a Halloween party I hosted. It was one of the biggest appetizer hits of the night. I didn’t mention that there were peas in the recipe, and no one noticed the “peas” taste. Thanks for the great recipe, I had a bunch of people ask for it and referred them to your website. Thanks! I just made it to bring for mother's day, it's FANTASTIC!!! I was a bit skeptical but I'm so happily surprised. I was so excited to try this recipe when I saw it, but after I made it, I wasn't a big fan. It tasted very sweet to me, and I was assuming it was due to the peas. I added extra onion, garlic, salt, pepper, and even some jalepeno. The peas I used were "early peas" and I thought those would be less sweet than "sweet peas." The only idea I have is to really cut back on the peas… Any other suggestions? By the way… LOVE this website, thanks for all the great recipes!!! You could also use a bit more of the lime juice, and using about 3 oz less of the peas. See if that will make a difference for you . :) Good luck! And thanks for reading! I don't know how I missed seeing this one! GREAT idea to help lower one of my personal favs! I noticed the ratio of cumin vs. avocado is pretty high, as one who is of Mexican heritage and grew up eating this, I would say, that is probably a bit much, a tad to add flavor would be better…. 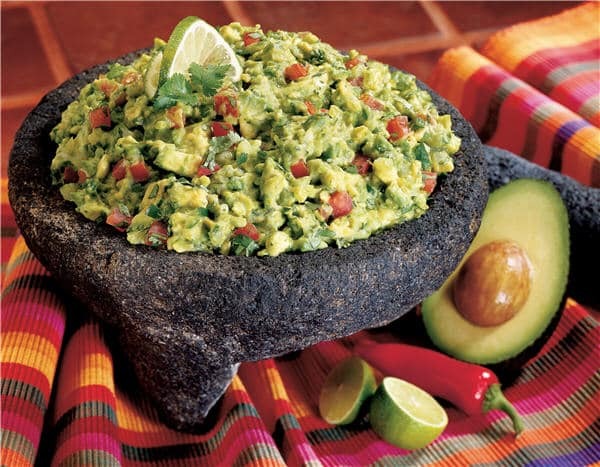 Just wanted to let everyone know that Whole Foods sells a Reduced-Fat Guacamole that is very similar to this recipe. I was planning on making this recipe today, but decided to take a look at the pre-made guacamole. Imagine my surprise when one of the first ingredients was peas! I put the nutritional info into my points calculator and it was only one point as well! It is also quite good! I will try this recipe next time though! Thank you!!! I can't wait to try it. I was wondering what the calorie and fat gram count was for this dish. I know it's 1 WW point. But can you share more info. Thank you! Sure! The total calories per serving of the Weight Watchers Guacamole Recipe is 84, fat grams is 3 and fiber grams is 4. Hope that helps! My husband and I just made this recipe and it was really good except for the overwhelming cumin taste. We don't usually add cumin to our guacamole so, when this recipe called for cumin we were surprised but followed it anyway. I love the texture but will probably use only a touch of cumin or none at all the next time. We also added a few drops of green Tobasco for a little extra kick. You say in your description that this is low points because you add 0 point peas. However, according to W.W. peas are one of the few veggies that are NOT zero points. What kind of peas are you using that are 0 points? Hi Kristin…thanks so much for catching that! !My post should have read "low Point peas"…not "0 Point peas". I have made the correction. The overall Weight Watchers Points Value for the recipe is still correct though. I have made a recipe similar to this one night when my friends and I had a "secret ingredient" night. NO one could guess what I put in the guac. Thanks for sharing this version I will be sure to try it. Do you take your own pictures? I have wondered this for a while! Hi Michele, I'm so glad that you are going to give this recipe a try — you'll really be amazed at how good it tastes! I HATE peas, but you can't taste them at all in this guacamole recipe. In regards to the pictures, I do take my own sometimes, but in most cases these are not my photos…just photos for recipe reference.